Yes, let us all wear black, for we now must take a long moment of mourning: the Harry Potter series has come to an end. What a tragedy for all humanity. No more Harry Potter stories from J. K. Rowling (the Single Greatest Author in the History of Civilization: screw those useless hacks Shakespeare or Christie or Neruda or Lewis, THEY never wrote about Nymphadora Tonks), and thus, no more Harry Potter movies. How will so many people now function with this brutal knowledge? How can the world continue spinning while we must, MUST continue our lives with no more tales from Hogwarts School of Witchcraft & Wizardry? Shouldn't we put the flags at half-staff? This is The End, beautiful friend, THE END...The end of all things. Life has obviously lost some of its appeal, for Harry Potter is no more. Yes, I am being thoroughly facetious. In another essay I shall offer my Personal Reflections on the Harry Potter franchise, but suffice it to say I have never fallen under the spell of The Boy Who Lived and am at a loss to understand why this particular franchise has become something people grab onto like others would grab onto someone slightly less important than Harry Potter, say, Jesus Christ. Honestly, I could never tell the difference between a Dementor and a Death Eater. Be that as it may, we now have the last of the Harry Potter films, well, to be precise the second part of the last Harry Potter film. Harry Potter & the Deathly Hallows Part II has me thinking it would have been able to be collapsed into one film (a very long one, granted) but there really to me was nothing to have others hyperventilate to the degree they have been. We pick up right where we left off at Part I: Lord Voldemort (Ralph Fiennes) has the Elder Wand, and now Harry (Daniel Ratcliffe), Hermione Granger (Emma Watson) and Ron Weasley (Rupert Grint) now must find the other Deathly Hallows to stop Voldey from being immortal. Hogwarts School is now completely taken over by Severus Snape (Alan Rickman) and is no longer a safe haven. Still, as the trio get more horcruxes (one within Gringott's Bank where we spend some time at), we now must go to Hogwarts where there is one more Horcrux (before I forget, the horcruxes are where Voldemort has parts of his soul). Within Hogwarts, the trio has allies: Professor McGonagall (Maggie Smith) and surprisingly, former Class Clutz Neville Longbottom (Matthew Lewis). The majority of Deathly Hallows II takes place there, where an epic battle takes place between Voldermort's Army and the students at Hogwarts. We do get side trips into the Pensieve (allowing Harry to see the memories of a certain character), the Forbidden Forest and what appears to King's Cross Station: Heaven. After an all-night siege at Hogwarts, we finally get many confrontations between Harry and Voldey, and we close Deathly Hallows Part II with a short epilogue taking place 19 years later at Platform 9 3/4. Having seen Deathly Hallows Part I, I still fail to see why Deathly Hallows deserved two films. Frankly, given how massive the J.K. Rowling book was I figure any adaptation of Deathly Hallows would short-change the text. 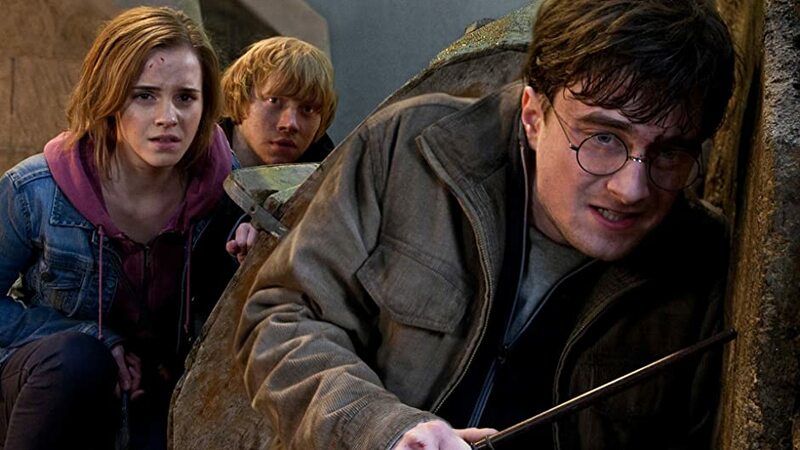 Let's take a look at the massive battle at Hogwarts (which comprises the bulk of the film). At the end of the night when Harry goes to see who has lived and who has died, we see that both Remus Lupin (David Thewlis) and his love, Nymphadora Tonks (Natalia Tena) as well as Fred Weasley (James Phelps) have been killed in the battle. Of course, it is all off-screen, so whatever emotionally impact their deaths might have had is lost on a muddled Muggle like myself. The readers have an emotional attachment to the characters (and get the bonus of reading their deaths), but judging by the film itself, we can't mourn for characters we don't see all that much. We can't mourn for them because we didn't get to know them in this film (emphasis mine). Yes, if (like myself), you've watched all the Harry Potter films, you might mourn for them. However, since we didn't see them die, how can you truly mourn when they just pop up dead? That might be at the heart of why Deathly Hallows (both One and Two) are a bit hollow. We have to rush through so much material we can't get any idea of why certain things happened. Whatever conflict inside Draco Malfoy (Tom Felton) had about having to be part of Voldey's Army (or what he was actually doing inside Hogwarts while the battle was going on) is not addressed. Same goes for the relationship between Neville and Luna Lovegood (Evana Lynch), which I don't even think was ever addressed or even hinted at in either Part I or from Order of the Phoenix onward, is now something that has to be accepted as an article of faith. That leads me to another issue I have with. Everyone in Deathly Hallows II has a lovely propensity to treat the text as if it were Holy Writ. Everyone is so serious in Deathly Hallows II, and yes, before any Pot-Heads go after me, I am aware that it is all very serious material. Still, given how Albus Dumbledore (Michael Gambon) pops up in King's Cross station of Heaven, you'd think or hope he'd have some humor to the situation. No, we can't have any humor in Deathly Hallows (no gallows hallows humor), because everything here is so important. We have to treat all the events as if they were major moments not just in the Harry Potter franchise, but major events in film history: Ron and Hermione kiss (call me a Muggle, but while I did expect that to happen, it still seem to come out of nowhere)! The trio face off an albino dragon and nearly drown in Gringotts! Frankly, I feel I was sold a bill of goods: while I grant that the battle at the Room of Requirement was exciting, what I had been told was an epic moment of brilliance at the vault of Bellatrix Lestrange (Helena Bonham Carter) was not (side note: I didn't see much if anything in Deathly Hallows Part II that would justify a 3-D ticket, but I digress). In its efforts to be important and great, Deathly Hallows II was not all that good. However, this isn't to say that it was lousy. A particular highpoint was Rickman's Snape; throughout the entire franchise (I would single out Half-Blood Prince) he's been a complex character: neither as evil as Voldermort or as good as Lupin. While his fate was surprisingly gruesome (more so in that it wasn't graphic), it was also remarkably touching. Here, we got an abridged version of the relationship between Severus and the future Lilly Potter (Geraldine Somerville) which has motivated all his actions. I would argue that it was pretty obvious what Snape's true nature was from Sorcerer's Stone, and that I had figured out what kind of person Severus Snape was without having to read any of the books, but I digress. As I've stated, the massive nature of Deathly Hallows II (at a mere two hours and ten minutes) doesn't allow for much stopping to have any of the other characters from the series (such as Emma Thompson's Sybil Trelawney, Robbie Coltraine's Hagrid, or Jim Broadbent's Horace Slughorn) to be anything but cameos in the film (I would even argue they weren't relevant to the story on film, so their appearance was unnecessary). The film was so large that I was not even aware that characters like Goblet of Fire's Fleur Delacour (Clemence Poesy) or Oliver Wood (Sean Biggerstaff) were even in Deathly Hallows II (curious side note: his character hasn't officially appeared since Chamber of Secrets and while I don't remember him being in that film his appearance in Deathly Hallows II is an even bigger surprise to me...and I don't remember seeing him in this film either). Now, I'm going to digress slightly to say that if Deathly Hallows Parts I and II were combined, it would run slightly more than four and a half hours. After seeing both of them, I still think it could have been possible to have combined them into maybe a three to three and a half hour film. It might seem strange for me to say that given how A.) I complain about the length of all the Potter films, and B.) how one of my complaints for both Deathly Hallows is that they are far too long. However, Deathly Hallows is by far the longest of the Harry Potter books, so it would already have to be long. Also, we could have cut a lot of the dancing from Part I and gotten to the horcrux of the matter faster (pun intended). Again and again, I think the length of Deathly Hallows II brought the picture down. 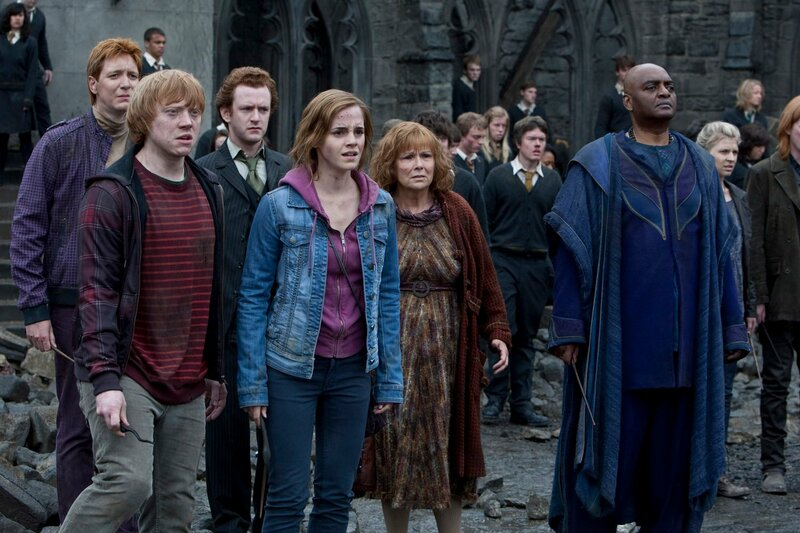 We have near the end a battle between the evil Bellatrix and Mama Weasley (Julie Walters). I imagine in the book its an epic confrontation, but in Deathly Hallows II its all done rather quickly. To my mind, it was both anti-climatic and rushed. Voldey's end feels the same (especially in the anti-climatic part). In all of this, I have only mentioned Rickman in terms of performances. I will grant a little leeway to Fiennes: I can tolerate Voldemort being rather hammy with that breathy delivery to his lines (I will always imitate "The Boy Who Lived....come to die"), so I can't fault him for being over-the-top. WAY over-the-top. Smith finally had something to do as the good (in every sense of the word) Professor, with her leading a "Hogwarts Spring" with the greatest of ease. The younger set have been consistently good (I'll confess that Watson was the weakest of the trio, but in Deathly Hallows II she isn't as bossy or annoying as she was in other Potter films, so that's a plus). I've always been a fan of Luna (I think she is the character I resemble most if Facebook tests are to be believed), and Lynch has also been consistently good in all her appearances. After Order of the Phoenix, I thought Lewis should get more screen time and credit for making Neville quite heroic (given how he'd always appeared a bit of a yutz in the early Potter films), so it was good to see him rise to the occasion. (Side note: how disappointed I was to see my favorite villain Dolores Umbridge not appear, but I can understand. That pink would have stood out garishly against all of the Dark Lord's Dark Brigade). Now, I will say that screenwriter Steve Kloves has never failed to follow J.K. Rowling's favorite literary device: the Deus Ex Machina. Here, we get the Ultimate in D.E.M. (topping even that damn time-reversal thing from Prisoner of Azkaban): a literal resurrection. Of all the things that would drive me crazy in how Harry never truly solves his problems but has them solved by an outside source, this one takes the cake. No worries, mate: Harry may die, but he just pops back to life to stop Voldemort at the most opportune moment. It almost robs one of the chance to really put Harry in mortal danger if he won't have to face the consequences of death, at least the first time. The Boy Who Lived Indeed. Finally, at the Epilogue, I've heard some people love the make-up work on the youngsters to make them look old, others have found them laughable. I'd say, why have an Epilogue at all, but since we have one, might as well go over it. The make-up work was to my mind uneven: Ratcliffe and Felton looked awful as old Harry and Draco respectively, but the Weasleys looked all right. My only question is, don't they have computers that can show you what someone will look like years from now? Couldn't they have used those to make them well, more believable? Just a thought. David Yates, having helmed every Potter film since Order of the Phoenix, brought the series to a respectable if not brilliant conclusion (certainly not to the brilliant conclusion I am demanded to say it is). All the other technical aspects (the cinematography, the sets especially) were on the high-end of production and they do deserve serious Oscar consideration (maybe one for Rickman, someone who should have an Oscar). I would say the only fault in this aspect is Alexandre Desplat's score: it didn't quite capture the power of the battle scenes, but that's a trivial detail. I've heard a lot of nonsense about Harry Potter and the Deathly Hallows Part II being a serious contender for a Best Picture Oscar nomination (the Dark Knight of 2011, so to speak). Given how nutty the Academy has been over the years, I wouldn't put it past them to give it a Best Picture nod, but I will wonder why. The film isn't as good as everyone has been telling me it is, and I think it's more the hoopla around this cultural touchstone more than anything else that is driving this passion for Potter. I could not, cannot, and have not worked great enthusiasm for the Harry Potter series no matter how often I've tried. Harry Potter and the Deathly Hallows Part II is not a bad film, but not a great film. 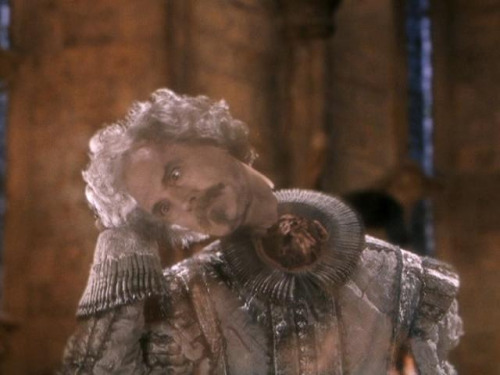 WHERE DID NEARLY-HEADLESS NICK GO? I DEMAND ANSWERS! * I have read one book (The Sorcerer's Stone), I didn't like it and had no interest in reading another Harry Potter book.